For a country the majority of whose people make their living from the agricultural sector, the two graphs on this page represent a disgrace. Both the commercial banks and the FDB have massacred their lending to the agricultural sector over the last ten years. Whatever their numerous advertisements claim about serving society, the banks are ruthlessly there for maximising profit and they don’t have to defend themselves. But what about the Reserve Bank (and the Ministry of Finance) who are supposed to encourage rural development? The graphs cast serious doubt on whether the Reserve Bank has any powers all, any ability, political will or even inclination, to address this terrible problem. What do the two graphs indicate? Between 1992 and 2003, the commercial banks and Fiji Development Bank have massacred their lending to the agriculture, forestry and fisheries sector. For the commercial banks, loans to agriculture plummeted from around 20% of their total lending in 1992 to a miserable 2% in 2003. Even for the Fiji Development Bank, the decline was from 28% of all loans in 1992 to only 12% of its loans in 2003. This decline in loans to agriculture is partly to be explained by the collapse of lending to sugar cane farming (more on that below). But only partly. 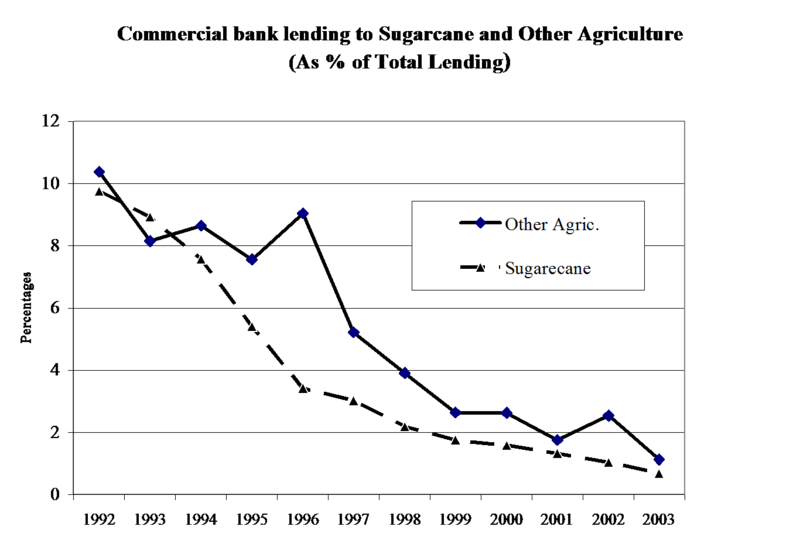 The second graphs shows that for commercial banks, while lending to sugar cane farming did decline from 10% in 1992 to a miserable 1% in 2003, the proportion lent to Other Agriculture also declined from 10% to 1%. 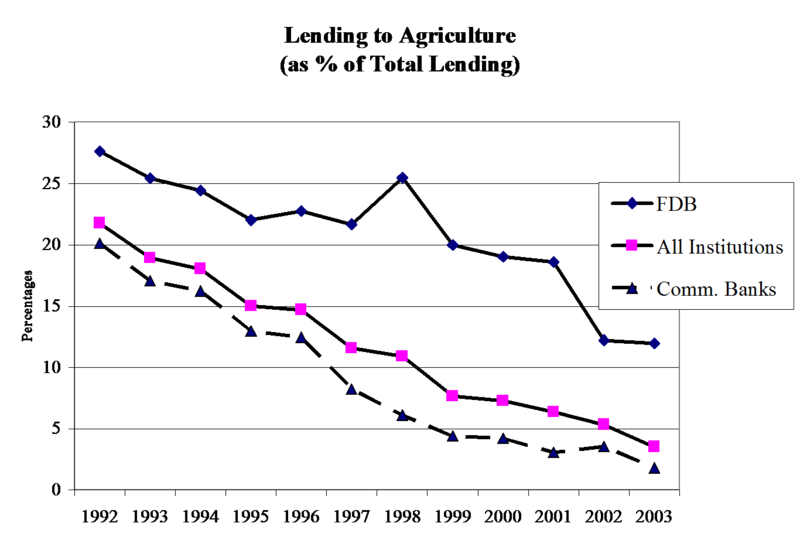 The collapse of lending has been to agriculture in general, and not just to cane farming. And the collapse is not just in proportions, but in real financial terms, leading to real hardships. For all financial institutions, the following figures, give the dollar amounts (in $millions) lent in real terms (deflated by the CPI). Over this period in real terms, while overall lending by all financial institutions increased by 7%, lending to Agriculture, Forestry and Fisheries has collapsed by 83%. For commercial banks, while overall lending increased by 14% in real terms, its loans to agriculture was massacred by 90%. For the FDB, while its own total lending has declined in real terms by 16%, its loans to Agriculture has declined by 64%. Of course, there has been a decline in production because of expiring land leases. But cane is still being produced and sold. And from roughly around 56% of sugar cane proceeds in 1992, the commercial bank loans declined to a miserable 6% in 2003. Virtually the entire burden of financing cane farming has been thrown back on to the cane farmers themselves. Those in need of finance would have to borrow from rural money lenders, with their exorbitant interest rates. Or just go without finance, cut back on fertiliser, pesticides, weeding, and any other inputs. Further reducing the sugar cane output, and contribution to the economy. Just as in cane farming, the reduction of loans to agriculture in general, cannot but have had a disastrous impact on rural incomes and contribution to the GDP. The GDP data states it all. From more than 22% of GDP in 1992, Agriculture’s share had declined to 15% by 2003. And the share is still falling. Some of the decline in agricultural GDP is no doubt due to factors such as non-renewal of native leases. But agriculture continues to contribute to the incomes of rural people and GDP. And sadly, bank lending (both commercial and FDB) have completely fallen off, even in relation to agriculture’s lower contribution to GDP. In 1992, agriculture’s share of GDP was around 20% while its share of loans was around 22%: roughly proportionate. By 2003, while Agriculture’s share of GDP had declined from 20% to 15%, its share of loans had plummeted from 22% to a mere 4%. In other words, the burden of financing rural incomes, has transferred almost completely to the rural people, with the accompanying hardships. And worse, note that while ten years ago the interest rate for loans to agriculture was about the same as the weighted average for all loans, today, agriculture pays some 29% higher than the weighted average interest rates. For more than a decade, variousFiji governments have insisted correctly that the rural sector must continue to be the back-bone of theFiji economy. And they have injected massive funds into the rural economy: via the NMA, the CDF project (of the SVT Government), the Agricultural Scheme (of the SDL Government). And no doubt more money will flow, good or bad. The Reserve Bank of Fijirecently had a symposium asking the very relevant question: can the financial sector be the locomotive of growth in Fiji? So have the banks played their part in helping government objectives in agriculture? The facts speak for themselves. In fact, the commercial banks and the FDB have been driving their locomotives backwards, completely massacring loans to agriculture, forestry and fisheries. There may well be sound commercial reasons for their doing so, but the fundamental problems must be faced head on and highlighted. But for the Reserve Bank symposium (going by their press statement), the banks’ massacre of agriculture was not an item needing to be highlighted. Indeed, only the Prime Minister urged the financial sector not to forget the rural community. But he also missed the boat in pleading with the banks to take their banking services to the rural community so they could save. But saving is not the problem for rural communities. Getting access to loans is the crucial problem. The Reserve Bank itself did not focus on why lending to agriculture had been massacred by the banks, and what could be done to reverse the trend. Monthly, the Reserve Bank focuses on macro-economic stability, raising interest rates to curb government spending (tough luck if the private sector is also squashed in the bargain), the cost of domestic violence to women, projections of economic growth rates (the domain of the Bureau of Statistics), costs of political instability, how to foster investment (FTIB’s role), etc etc. All important topics no doubt. But hardly about how the Reserve Bank could guide theFiji’s financial institutions into genuine partnerships leading the economy forward. In the 2005 Budget, there are a couple of positive measures which may help the financing of the rural sector- such as funds for interest subsidies, by which the Fiji Development Bank is being encouraged in its rural development role. But the interest subsidy is no help if loans are not being made to agriculture and rural areas. The Minister of Finance also thanked the ANZ and gave them tax incentives for allegedly taking banking services out to the rural communities via a few vehicles. But the ANZ/UNDP initiative is not about improving lending to the rural sector, is it? For decades now, the commercial banks have been closing down not just the agencies but their local branches. And it was the local branches and the locally based staff who were in a good position to assist in lending to the agricultural borrowers. Not the staff sitting inSuva. So is the ANZ initiative merely going out to collect the large amounts of cash that is circulating in the rural areas, much derived from our recent growth in remittance earnings, and currently bypassing the banking system? Are rural people merely being encouraged to deposit their cash with the banks- where they will receive virtually zero interest rate (and negative in real terms), only if they leave their deposits untouched- like time deposits, but without the higher interest rate? And will they pay large fees if they make withdrawals, effectively losing a large part of their savings? Over the last decade, the commercial banks have increased all manner of fees and charges, many penalising the very people who deposit money for the banks to profit from. Every year, they continue to legally steal millions from savers by paying virtually zero interest rates, which are well below the rates of inflation. $1000 saved with the banks in 1997 will be worth only $870 today- a loss of 13% of the real value. Even time deposits will have lost 3% in real value. These banks discriminate against the local staff in salaries and other conditions. They are reluctant to lend to small borrowers unless they have ironclad collateral guarantees. Such problems in the financial system have apparently disappeared from the Reserve Bank’s horizon. Just as the massacre of loans to agriculture has disappeared between the intellectual cracks, the cocktail parties and the mutual admiration societies that currently prevail amongst the corporate and bureaucratic power-brokers of Fiji.